I am so grateful to be surrounded by creative colleagues and friends who inspire me to create and connect with my children. Jean Van't Hul, creator of the popular kid's arts and craft blog, The Artful Parent, has been someone I have admired for years. I love seeing what genius new and creative ideas she comes up with! 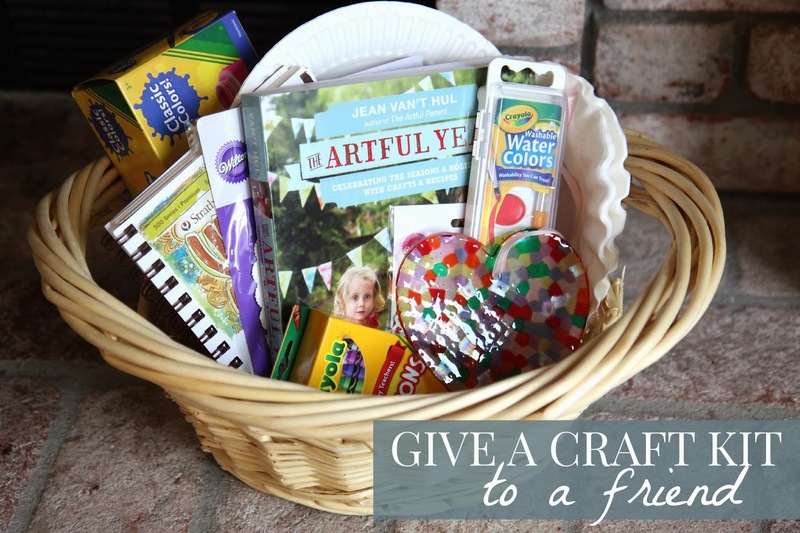 I was so thrilled to be invite to participate in her Blog Book Tour for her newest book, The Artful Year: Celebrating the Seasons and Holidays with Crafts and Recipes. From the moment Jean's book arrived in our home a few weeks ago I have felt inspired to create more with my kids. Jean has an amazing way of helping children create beauty and connection through the simplest activities. Today as I share about The Artful Year I am going to tell you a little bit about the book, share one of the activities we tried from it, and tell you how we are including the book in our 100 Acts of Kindness Challenge! The Artful Year is filled with over 175 activities that can appeal to children ages one to eight. favorite seasonal recipes that are fun to make together and eat! I love that each section of the book is broken down by season and includes a detailed table of contents for each section so that I can easily find activities and crafts I want to try. I also think it is fabulous that in the section of the book that features activities for all seasons, Jean breaks down each activity and shares seasonal variations for each one. 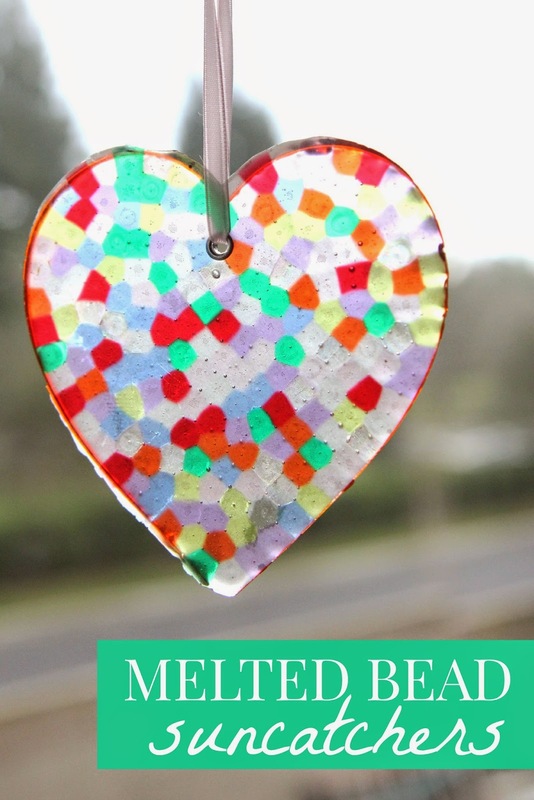 When I began scanning through Jean's book with my kids we discovered the melted bead suncatchers on page 128 and my kids immediately said that we need to make them asap! We gathered up the few supplies that we needed (translucent pony beads, metal heart baking pan and cookie cutters, an old cookie sheet, some grommets, and out toaster over) and we invited some neighborhood friends to join us for a crafternoon (ie. an afternoon of crafting)! Our house is currently under construction and our back patio is gone, so we grabbed an extension cord and brought our large toaster oven out to the driveaway. 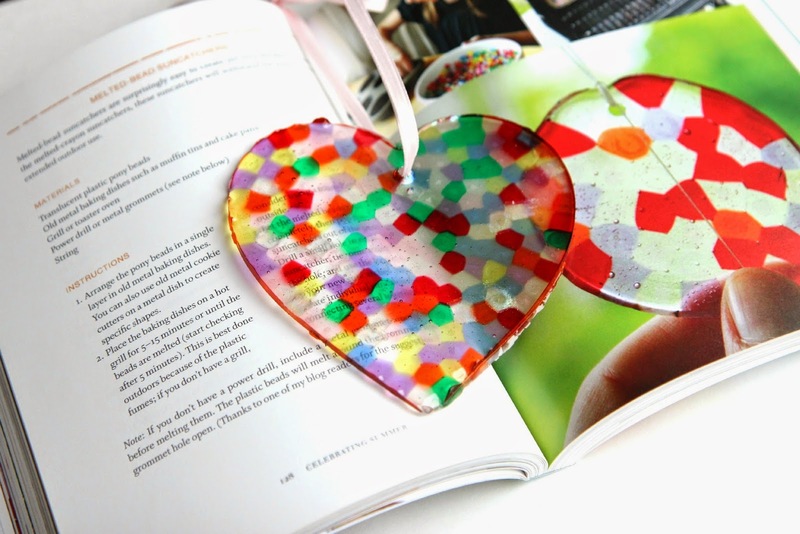 To make one of the versions of melted bead suncatchers that Jean shared in her book you simply place translucent beads inside a cake pan or muffin tin. We decided to make ours a bit more festive for Valentine's Day and we used some heart pans and heart cookie cutters. From there the kids started getting even more creative ideas and wanted to try making these using the letters of their names. The plastic fumes aren't good to be smelling in a closed space, so we made sure to do this outside so we had lots of ventilation. Since we were outside the kids rode bikes around while they waited for the plastic beads to melt and then they would come back and check on them again and again. The kids (ages 2-8) had so much fun with this activity that we were creating... and waiting... and creating for almost 3 year hours! Once it started getting dark and we had to wrap up the project all of the kids were begging for us to get to do it again another day. I think it was a hit! On a few of them we even followed one of Jean reader's suggestions to add a grommet inside the pan/cookie cutter so that once the plastic beads melted a little hole would remain (not covered in plastic) to make it easier to string up the suncatchers! Genius! We probably could've popped out the grommet but the kids thought it made it easier to put the string through the holes, so we left it. I love how Jean says that celebrating doesn't have to be a party... we can also "celebrate by noticing, sharing, capturing, and creating." Our whole crafternoon experience with the neighbors was such a sweet one. Kids noticed each other's creations, cheered one another on, got inspired by each other, and connected in such darling ways. In additon to creating with my kids I love sharing our favorite crafty activities and resources with our friends. The neighbor kids (and their mom) loved checking out Jean's book and seeing all of the amazing ideas inside. As part of our 100 Acts of Kindness challenge we decided that we wanted to create a Valentine's Day Crafty Kit using The Artful Year and give it away to one of our friends. Inside the Valentine's Day craft kit we included several items needed to do some of our favorite Valentine's Day activities from The Artful Year. Now that we made melted bead suncatchers we are already filling up the pages of our copy of The Artful Year with post-it notes as we decide what to do for our next crafternoon with friends! 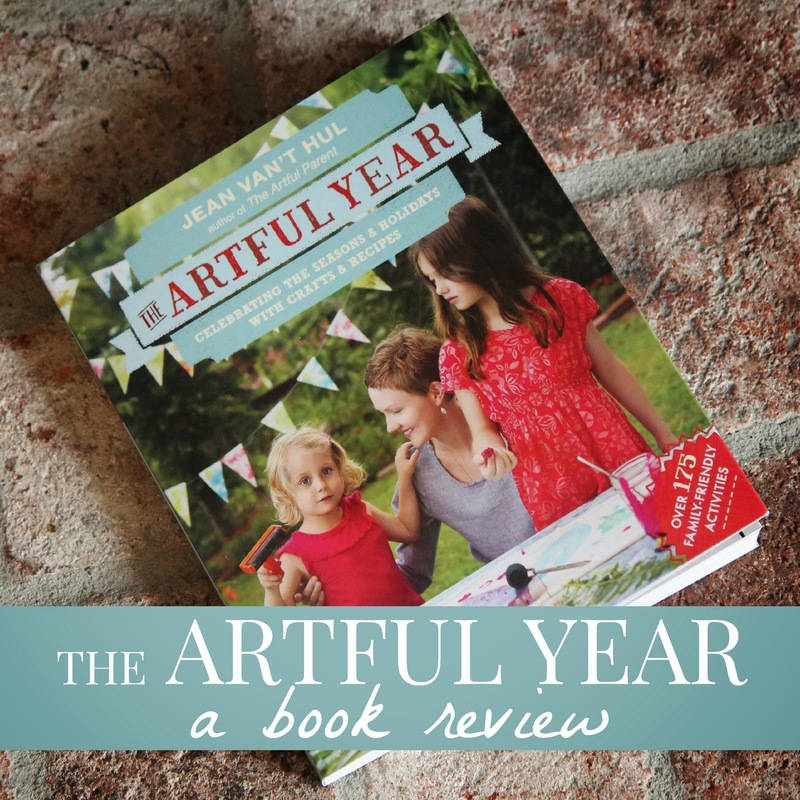 You can grab your very own copy of The Artful Year, (the #1 New Release in Crafts for Children on Amazon), wherever books are sold. 26 of my favorite BLOGS will also sharing sneak peeks into The Artful Year over the next month. You can check them out by following the schedule below. The Artful Year is gorgeous, filled with inspiring ideas, and totally do-able. I love it! Let me know if you have any questions about the book! I would LOVE to tell you even more about it! Disclosure: I received a free copy of The Artful Year so that I could share it with you. All opinions are my own. I'm very interested in the melted bead technique. But what kind of beads do i need ? I don't seem to find the right kind even on amazon. What temp on the oven and how long? These are SO cute - will be trying this soon!